Bates County is a county located in west central Missouri in the United States. Its county seat is Butler. The county was organized in 1841 and named after Frederick Bates, the second Governor of Missouri. 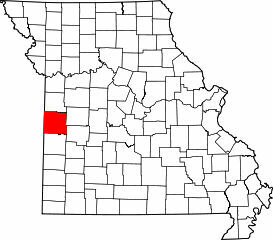 Cemeteries of Bates County, Missouri are located across the county. Listed here are cemetery records that have been published online. When Bates County organized and separated from Cass County in 1841, county commissioners selected Harmony Mission as the first county seat, presumably because of the established development and central location. Bates County, Missouri is located on US Highway 71/I-49 in West Central Missouri along the Missouri - Kansas Border, about 70 miles south of Kansas City.